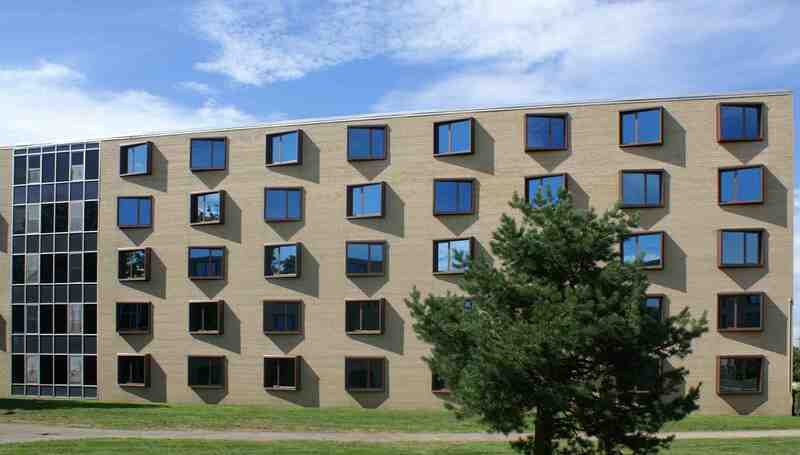 Wausau, Wis. -- Eastern Michigan University (EMU) recently remodeled its First-Year Center adding visual interest to its campus, thanks to the angled, copper-colored windows from Wausau Window and Wall Systems. The freshman-focused facility includes a dining commons and four wings of a residential hall, which house 600 students. 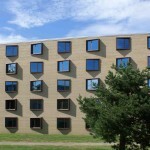 Many of the center's windows were original to its 1960s construction and needed to be replaced with newer, energy-efficient windows and frames. Rather than replicate the existing flush-frame window placement, Detroit-based Hamilton Anderson Associates put a geometric spin on the project, setting the frames at various angles against the building. To attain the architect's unique design, glazing contractor Trainor Glass Company installed more than 675 operable, high-performance, Advantage by Wausau® 2250-LP Series low-profile windows. Ideally suited for educational facility renovations, Advantage by Wausau products are competitively priced, available on an accelerated delivery schedule, and backed with an industry-leading warranty of up to 10 years. For EMU's First-Year Center, Wausau's Low Profile Series earned an AAMA AW-60 rating, as well as helped to increase daylighting, lower U-Factor and widen the view. 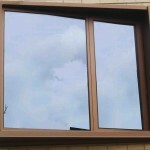 The 2250-LP Series fixed windows can achieve a U-Factor as low as 0.32 BTU/hr.sqft.degF in winter months (R 3.1). During the summer months, screens keep out insects, while allowing for natural ventilation. 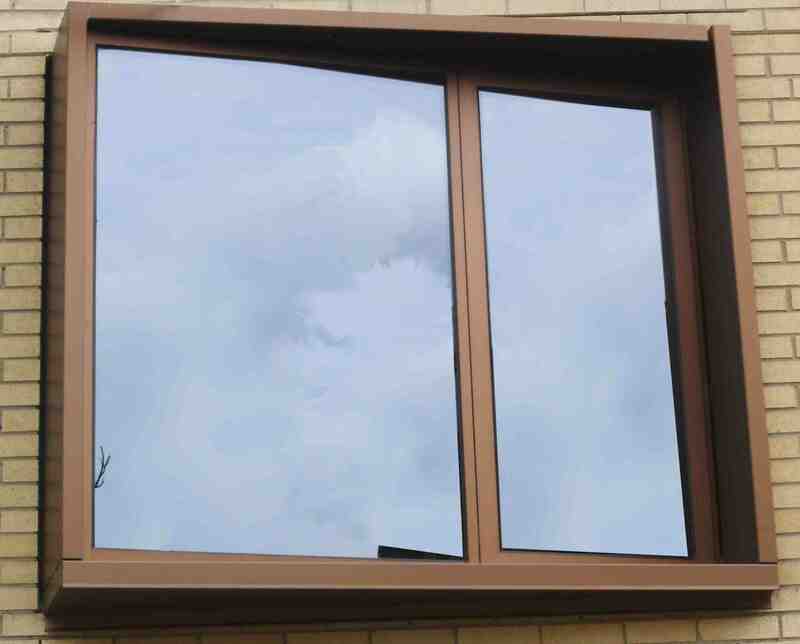 Contributing to the windows' performance are the Low-E insulating glass from Viracon, Inc. and the thermal barriers applied by Linetec. Linetec also applied the eco-friendly, copper anodized finish on Wausau's 2.5-inch-deep, aluminum framing. Compared with traditional etch processes, Linetec's anodize process for Wausau consumes less energy and reduces waste sent to landfills by 90%. This low-maintenance, durable finish maintains its frosty, matte, copper color and does not patina over time. Its striking contrast to the center's blond brick exterior will remain as the architects' envisioned it for years to come. Looking toward the future, the $3.1 million window renovation is part of the University's "Education First! Initiative." The initiative calls for many campus buildings to be upgraded to provide a more comfortable environment for students and staff. Additional improvements to the First-Year Center include a major, exterior cleaning; new siding; new elevators; and new wireless Internet throughout the complex. "The renovations we made upgraded and modernized this highly utilized facility," said John Donegan, EMU's chief of operations. "Not only will it be more energy-efficient, but the exterior renovations will make the entire complex more attractive and visually-appealing for our students." Eastern Michigan University, First-Year Center; Ypsilanti, Mich.
* Owner: Eastern Michigan University; Ypsilanti, Mich.
* Glazing contractor: Trainor Glass Company; Allan Park, Mich.
* Glazing systems - manufacturer: Wausau Window and Wall Systems; 2250-LP Series low-profile windows; Wausau, Wis.
* Glazing systems - finisher: Linetec; eco-friendly copper anodize; Wausau Wis. In celebration of 70 years in business, Quaker Windows & Doorshas announced the introduction of its newly patented window products featuring OPTICORE TECHNOLOGY.